On Friday I received a rare phone call from a friend who knows nothing about the Internet except OLX. Okay I’m exaggerating. He also knows something about Facebook but even after joining the social networking site two years ago, he has zero posts. He has a Gmail account that he has used only once – to send me a notification that he acquired an email by himself. Although tech un-savvy, he loves OLX. OLX, he says, helped him acquire a second hand fridge for less than half the price, used it for six months, and sold it, through OLX, for a 30% profit margin. So he is always one of the first to know of any minor or major developments that OLX does. On Friday he was very excited. He had learnt that OLX had upgraded the OLX App to a version that’s easier to use – especially for him who detests anything that requires more than common sense to use. As soon as he learnt of the new version of the OLX App, he went to Google Play and downloaded it, and posted, without asking anybody for help, an Ad for an item he had intended to sell. “Man have you tried the new OLX App?” he asked immediately I received the call. “There are, the new App is the easiest to use, ever”, he explained. “Too bad I didn’t try the previous one”, I told him. “You still have to try it, you will stop finding faults with OLX”, he said. That was Friday. On Saturday I went to visit him (of course the visit had nothing to do with the new OLX App) as his phone call had reminded me that it had been so long before we saw each other. After catching up, the lad could not wait to show me how easy it is to use the new OLX App. Then the ease of use is just amazing. Take a keen look at the image above. See how easy it is to access the “Submit an ad” link. The link is big, easy to access, and has this great look. Once you press on the “Submit an ad” link, you are taken to the image below. Take a good quality picture of the item. Most times people will be swayed due to the image. Your ad should always have a catchy title and be interesting for anyone who will see it. Be creative but do not embellish the truth. 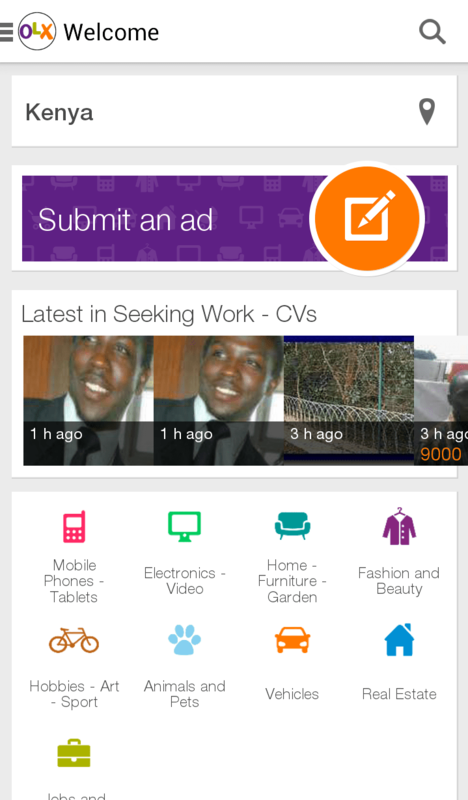 So the new OLX App is meant to allow you take great pictures, preview them easily, and create an ad on the go. 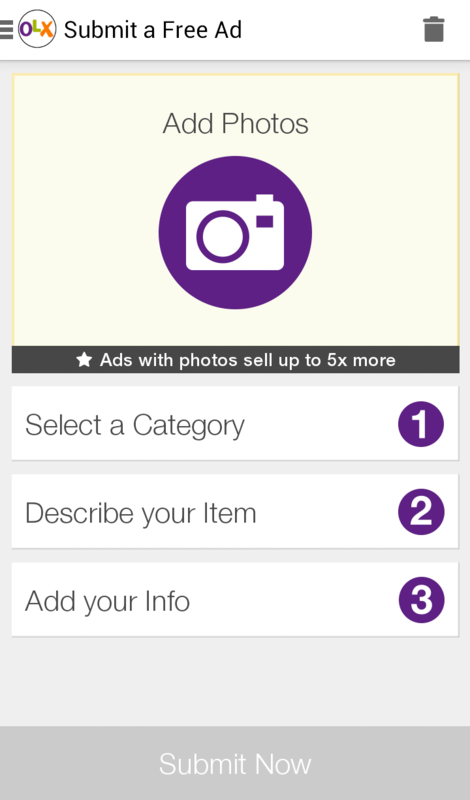 After you have taken your photo, OLX App will select it as the photo you want to include in the ad. By the way clicking on the OLX photo link shown above also allows you to select photos in your gallery that you may select to include in the ad. Then you have the “Select Category Link” which is very important. I have personally browsed through items in OLX and realized that there are a significant number that have been placed in wrong categories. This alone might make your ad not to attract buyers. If you want to sell an electronic device but you have posted it under Fashion, then don’t get irritated if after the 10th day no one has bothered to call you for enquiries. To get the best out of your ad, use descriptive words. Make your wording enticing to potential buyers. Simplicity is not always the best option. Finally there is the link that asks you for your information named “Add your info”. To prevent con-artists from defrauding unsuspecting buyers, OLX is now emphasizing on the need for those placing ads to both provide their email addresses and phone numbers. Thanks to the government’s requirement that all numbers in Kenya must be registered, it is now easier to follow up on sellers who con unsuspecting buyers through the legal channels. 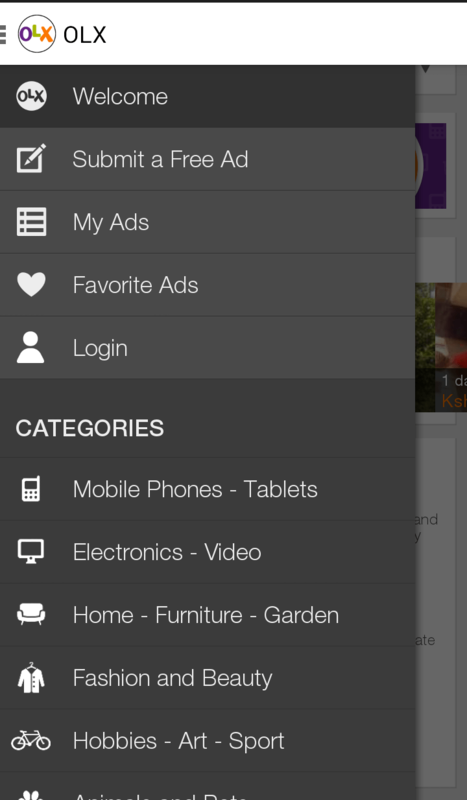 So it is quite easy to place an ad using the new OLX app, what about browsing for items to buy? The first thing that the new OLX app does is to set your location. Well, although I stay near Kasarani, the app set my location as Komarok. To set your location properly you need to click on the location icon just after the word Kenya at the top of the image but below OLX Welcome message (see image 1). In the next page you’ll be able to see Autolocation which you can swipe left to disable. Then you’ll see your country has been selected to Kenya below which you can click on “City” to search or browse for the appropriate city. At times you may want to browse for items posted from any part of the country but the fact that your current city has been selected prevents you from doing that. I browsed through the locations under City to check if there was an option to select Any but there was none. The only way to go around this is to go to country, scroll down to Kenya, and select it. This way, the City will be set to blank. I think OLX needs to do something about that anomaly. After you have properly set your location as described above, you can then browse through the items by visiting the categories (see image 1 above) or even search for an item you intend to buy from the search bar. Visiting the OLX menu either by pressing on the menu icon at the top left of the App (see Image 1) or by pressing on menu key on your phone takes you to a screen as shown in image 3 below. As you can see, you can also access categories by following the same procedure. I have to admit, the new OLX App is rather easy (fun too?) to use. If you think I’m kidding, just download it and try it…Android users can get it via this link. Social Media: Kenya’s double edged sword. OLX Kenya to sponsor Social Media Awards 2014. Is free Google Search helpful to anyone?